Canada might be right across the border but there are a lot of things that your fourth grader might not know about her next door neighbor. What are the citizens of Canada called? What currency do they use? What is their national icon? 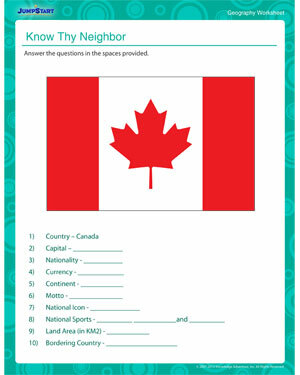 ‘Know Thy Neighbor’ is a free and printable geography worksheet that helps fourth graders know Canada better. Make sure this world geography worksheet finds its way to your kid’s curriculum this year!